Considered one of France’s great 20th century photographers, Robert Doisneau (1922-1994) created an archive of 450,000 original negatives by the time of his death. Alongside other noteworthies like Brassaï and Édouard Boubat, Doisneau illuminated the humanity of Parisians struggling to resume everyday life in the aftermath of World War II. Although he began taking pictures at the age of sixteen, Doisneau’s natural shyness led him to prefer shooting objects instead of people. Eventually, he would turn this to his advantage, using the invisibility of the photographer to uncover the poetry of the streets, which would become his lifelong subject. Through surreal and humorous juxtapositions, Doisneau revealed the warmth of city life all around him. As World War II threw Paris into disarray, Doisneau was drafted into the Resistance as a soldier and a photographer, capturing the occupation and liberation of Paris. Perhaps his most famous picture, Le Baiser de l’Hôtel de Ville (The Kiss by the Hôtel de Ville), 1950—included in the current exhibition—distilled the romance of the city in the post-war era. His freelance photography appeared in the pages of Life and Vogue, and his work continues to be shown and celebrated today internationally. 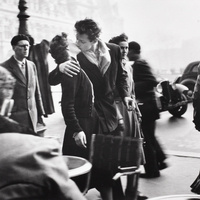 Robert Doisneau: Paris After The War continues until May 24, 2019 in the Dubois Gallery, Maginnes Hall on the 4th floor. Hours are Monday through Friday 9 AM – 10 PM.